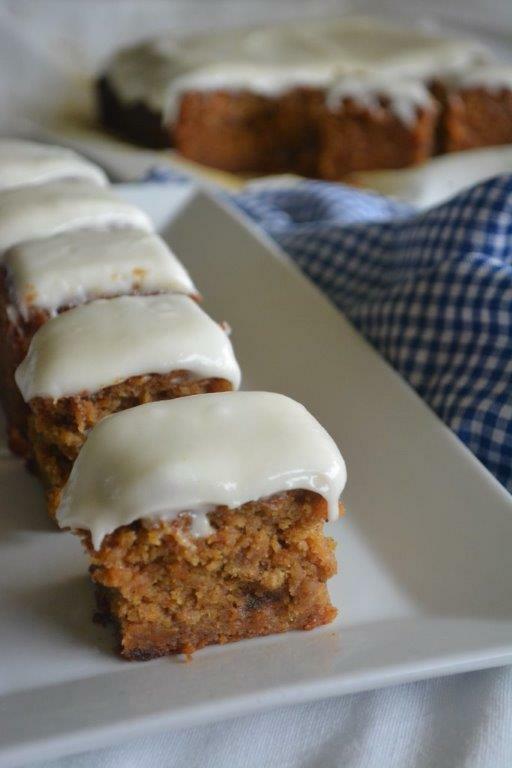 I’ve been more than a little obsessed with gluten-free carrot cake ever GF and Me, one of my favourite food blogs, posted their recipe for Spiced Carrot Cake. It’s gluten-free and dairy free, but it was the picture of the cake that really intrigued me. Click through to see how beatifully moist that cake is. OMG. And what’s more, it’s got pineapple in it and coconut flour. A taste sensation! Well, I just had to make it. And it was amazing so I blogged the result. Since discovering that recipe, I’ve not had any interest in developing a carrot cake recipe until recently, when I started to think about Moroccan flavours and how well they would work in a carrot cake. I tinkered with this recipe for a while and was really pleased with the results. The carrots, dates, honey and spices really work beautifully together and they make the texture moist and strong. A lovely recess-time treat. My recent recipes look a food tour of the world – Vietnamese cold rolls, Italian style Cornbread and now Morocco. I might keep going to see what other cultural delights await. Preheat oven to 180° Celsius (conventional oven) or 160° Celsius (fan-forced oven). Grease and line a square 21 cm cake tin. Put eggs in large bowl of an electric mixer and beat on medium speed for 5 minutes. In the meantime, put dates into a microwave safe bowl and cover with cold water. Cover the bowl with a plate or plastic wrap. Microwave on high for 3 minutes. Drain thoroughly and allow to cool a little. Purée until smooth. Into the bowl with the eggs, sift in the tapioca flour, sorghum flour, brown rice flour, baking powder, cinnamon and psyllium. Add the sugar, carrots, dates, 1 ½ tbs honey, oil and milk. Mix until well-combined. Pour mixture into cake tin. Bake for 55 mintutes or until a skewer, when inserted, comes out clean. Allow to cool in tin. To make the icing, put ricotta cheese and honey into bowl of an electric mixer and beat on high for 2 minutes. Scrape the sides of the bowl to make sure the honey is evenly dispersed. Add the icing mixture and milk and beat until well-combined. Once cake is completely cooled, remove from tin and spread icing evenly over the cake. Cut into 5 cm x 3 cm slices to serve. As I have a child with Coeliac (Celiac) Disease, my interest is gluten-free food for kids, particularly for the school lunchbox. All text and images on this site are copyright © Kate Crocker 2012-2018 (unless noted) and may not be used without permission.